To accomplish the unbelievable, all you have to do is believe. Unfortunately, that was not the case early on in the incredible journey of the team that made the most unlikely Cinderella story in Philippine sports last year. Before the country’s oldest collegiate league even began its 91st season, a lot of people already counted the Letran Knights out as contenders for the men’s basketball crown. The long list of doubters included the Knights themselves. It’s uncharacteristic for any competitor, but those with the team were just being realistic. After all, the Intramuros-based dribblers had missed the playoffs the previous season and were supposedly a team in transition with basically the same all-Filipino squad under unheralded rookie coach Aldin Ayo, whose optimism some of the players initially found hard to believe. “Nung sinabi ko na naniniwala akong kayang mag-champion, many of them laughed,” Ayo admitted, recalling his conversation with his wards in one practice before the start of the season. But the defense-minded coach kept the faith, and after impressive early returns, the players started to believe they could end their decade-long title drought and write one unbelievable underdog story. “Hindi pa nagsi-sink in until na lang na matalo namin ‘yung JRU sa second game namin sa eliminations, saka na lang naniwala,” said Ayo, whose system that’s predicated on a suffocating full-court pressure defense had the Knights winning their first seven games. Stars Mark Cruz and Kevin Racal showed the way as expected, but what’s unexpected was the scoring outbursts of defensive ace Rey Nambatac. Rookie Jomari Sollano and veteran McJour Luib also provided unlikely but significant contributions to pose a plausible threat to the long-standing dominance of defending champion San Beda. When Manny Pacquiao, another sporting legend known for beating huge odds, signed on as the Knights’ team manager, the stars for the Knights’ one-of-a-kind season seemed to align some more as it gave the underrated squad a big financial and psychological boost. Winning just six of their next 11 games, the Knights finished second in the elims behind the Red Lions and entered as the only team without an import in the Final Four. This only kept their belief on themselves stronger, especially after dispatching the Mapua Cardinals led by Nigerian Rookie-MVP Allwell Oraeme and thus setting up the Finals battle with the Red Lions. The Knights, who lost to San Beda twice in the finals during the Lions’ five-year reign, proved that third time’s the charm as they put an end to the Lions’ dynasty. 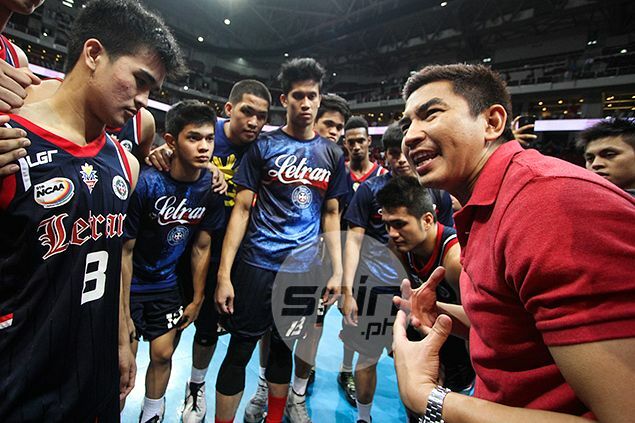 But Letran’s faith was once again tested in the series. After Letran took the title series opener, San Beda bounced back strong to force a decider. And the doubts even got stronger in the final game of the season as the Knights squandered a late eight-point cushion in regulation. But this unfortunate, usually demoralizing situation — heading into overtime with momentum not on their side — only made the Knights’ underdog tale more epic. Letran eventually finished off San Beda’s long reign in overtime of the rubber match before over 20,000 fans at the Mall of Asia Arena. All because they believed in themselves up to the very end.